AttorneyGuide.com is a comprehensive online attorney directory of Certified Ethical™ attorneys practicing in Las Vegas, Reno, and greater northern and southern Nevada. Choosing an attorney is a very serious decision, regardless of the nature of the case. You should receive the best representation available, but it can be difficult to find the right attorney without help from a trusted source. AttorneyGuide.com solves that problem. AttorneyGuide.com is a free Nevada attorney referral directory and free legal information service that limits its membership to attorneys who have established strong ethical credentials over time. No attorney listed on AttorneyGuide.com has ever been found guilty of unethical conduct by any of the 50 state bar associations, including the Nevada State Bar. We also constantly screen our attorneys to assure you that they are in good standing with the Nevada State Bar. In addition to being a trusted Nevada attorney directory, AttorneyGuide.com is also a rich resource where you can find out your legal rights, how to enforce your rights, what responsibilities your attorney has to you, basic legal information, and, of course, help you find an attorney in Nevada who specializes in your type of case. We currently serve the state of Nevada, and most of our lawyers are in Las Vegas, Henderson, Paradise, and Reno. We also have attorney listings in Sunrise Manor, North Las Vegas, Spring Valley, and many other Nevada cities. If you do not find an attorney in your area in Nevada on our site, call us, and we’ll find one for you! AttorneyGuide serves both Las Vegas lawyers in Southern Nevada and Reno lawyers in Northern Nevada, along with other Nevada attorneys and lawyers in the smaller cities outlying Las Vegas and Reno, Nevada. Find a Nevada Lawyer In Southern Nevada. AttorneyGuide.com helps you find a Las Vegas attorney you can trust. AttorneyGuide.com allows you to find a Las Vegas Lawyer in the exact field and region you specify. You can review the qualifications and credentials of Las Vegas lawyers and once you have found the Las Vegas attorney that best fits your needs, you can contact them directly from our website. Every Las Vegas attorney and Las Vegas lawyer listed on AttorneyGuide.com is reviewed by our staff. In addition, there are may be other Nevada lawyers and attorneys listed on our website from the smaller cities in Southern Nevada outside of the City of Las Vegas, including lawyers and attorneys from Henderson, Nevada; Boulder, Nevada; Pahrump, Nevada; Pioche, Nevada; Caliente, Nevada; Goldfield, Nevada; Laughlin, Nevada; Fallon, Nevada; Searchlight, Nevada and others. Find a Nevada Lawyer In Northern Nevada. 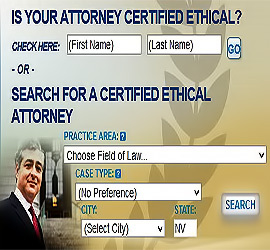 AttorneyGuide.com allows you to locate a Nevada lawyer from a comprehensive list of quality Nevada attorneys who practice in the exact legal field and region you specify, including but not limited to: Accident Law, Bankruptcy Law, Business Law, Consumer Credit Law, Criminal Defense Law, Employment Law, Entertainment Law, Estate Planning Law, Family Law, Financial Law, Government Law, Immigration Law, Insurance Law, Intellectual Property Law, Litigation Law, Personal Injury Law, Real Estate Law, Social Security Law, and Tax Law. AttorneyGuide.com helps you find a Reno attorney you can click with. AttorneyGuide.com allows you to find a Reno Lawyer in the exact field and region you specify. You can review the qualifications and credentials of Reno lawyers and once you have found the Reno attorney that best fits your needs you can contact them directly from our website. In addition, there may be other Nevada attorneys and lawyers listed on our website from the smaller cities in Northern Nevada outside of the City of Reno, including lawyers and attorneys from Carson City, Nevada; Sparks, Nevada; Elko, Nevada; Ely, Nevada; Minden, Nevada; Gardnerville, Nevada; Battle Mountain, Nevada; Fallon, Nevada and others.